If you’re in the market for an antique handsaw but scared you’ll end up with a clunker, fear not. Josh Clark, a used-tool vendor with decades of experience, shares his criteria for which saws are worth buying and which you should walk away from. The list isn’t long, but it will spare you from some clunkers. So we’re going talk about handsaws specifically, and you’ve seen a lot of saws. A lot of saws. Yeah. 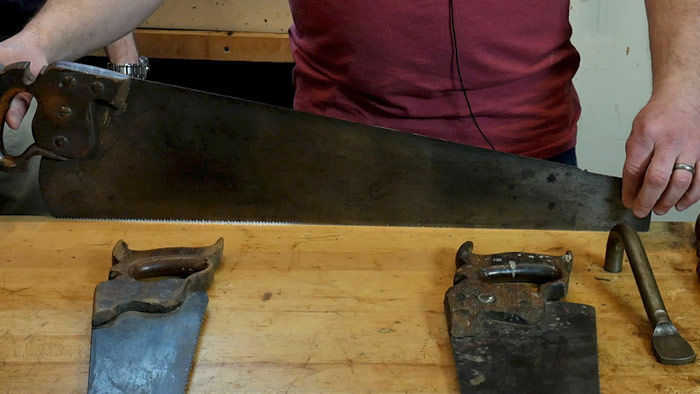 What are your criteria when you’re looking for a good used handsaw? 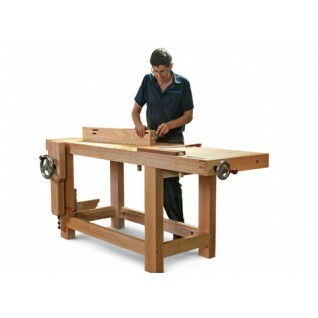 I’m looking for saws that people can use. So the most important thing to me is the plate and if it’s straight. I’ll sight down the plate and see if it’s bent or or kinked. 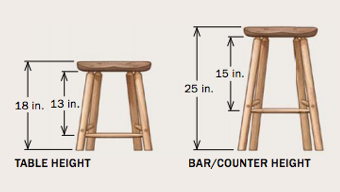 If one has a little tiny bend that’s not a big deal. It can be worked out, or it might not matter at all. I prefer a straight plate but a little bend like that isn’t going to hurt anything. If it has a pretty bad kink it’s not worth my time. If we try to use it, it’s going to bind in the cut, it’s going to make the blade bend funky, it’s just not going to be a usable saw. There are a couple of people who might be able that get the kink out but it’s probably not worth it. If it’s a good plate, the saw will most likely cut. Does the handle or tote tell you anything? A chip on a saw tote doesn’t bother Josh as long as it still feels good in the hand. I prefer a nice unbroken handle. One saw I use all the time has a little chip, but it doesn’t bother me as long as it feels good in the hand. I don’t really care if it has a few chips or whatnot. You’ll find a lot of saws had the top horn cut down so it can fit in a toolbox. If you can find a nice complete handle, it makes it more valuable saw. But as long as it feels good in my hand, that’s all I really care about. Are you worried about the handle being loose, because sometimes I’m in an antique market and everything looks great but the handle feels a little sloppy. Most of the time, we can just tighten them up with a screwdriver, or if they’re split screws we can either make a split screwdriver or you can buy one from a number of different places. It’s not that big of a deal to tighten up a loose handle. What about the teeth? The saw will probably be dull, but are the teeth going to tell you anything? What I really want to see is decent teeth. I don’t want to see too many broken teeth. One or two aren’t a big deal depending on where they are in the tooth line. Two or three in a row–that’s not going to be great. Or if there’s a tooth missing up at the toe that might be bad for starting a cut. Any more than one or two missing and it would really need to be retoothed. The other thing to look at is the tooth line. 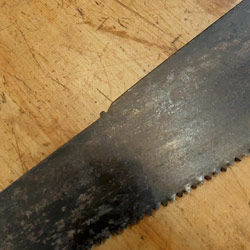 You might have a pretty well-used saw, but if it’s been well maintained, it’s been jointed so there is a straight edge. 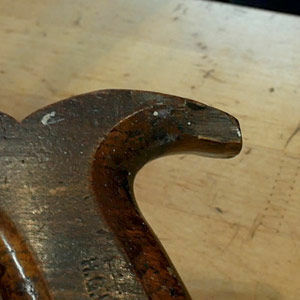 Some saws will still have a little bit of the original breasting, and the tooth line is a little bit convex. If the tooth line is concave, it’s been sharpened enough times that it really needs to be jointed and refiled. It’s not a big deal, but it depends on how skilled you are sharpening a saw, and whether or not you’re capable of doing it. Josh likes to see a toothline that is slightly breasted, or convex. If the toothline is concave it will need to be jointed before sharpening. Not an impossible task, but something to keep in mind. A lot of saws I see are Disston, but I know there are other names out there. Should I pay attention to one name as opposed to others? There were literally hundreds of saw makers in the United States. By far, Disston was the most popular one. They’re the most frequently found because Disston made millions of saws–they were largest saw maker in United States for a long time. Up until about 1890 or so there were over 400 different saw makers in the United States. Then as we approached 1900, there were only a handful left. So by far, you’ll find more Disston than anything else anywhere in the country. But as long as a saw’s got a good plate and a decent handle it’ll cut–so I’m not too focused on names. 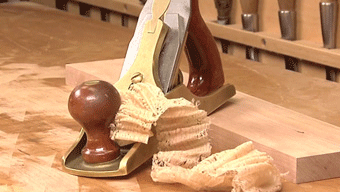 There are certainly other good saws that aren’t Disston. 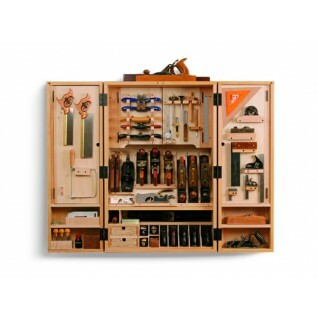 Simonds made excellent saws, as well as Atkins. 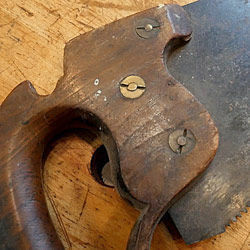 Personally, I’m more interested in the late 1800s saws that were made in Brooklyn, N.Y. I like Harvey Peace saws. They were the fourth largest saw maker in the United States in the 1880s. But you don’t hear about them, because compared to Disston, they were relatively small. But they made excellent saws. I’m really interested in those. You’ll also find saws with medallions that say Warranted Superior. And those were likely second line saws made by major saw manufacturers. 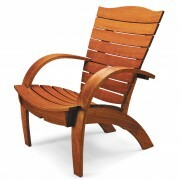 They had lesser quality wood or less finish. They just sold them for less money. They didn’t put their name on it, but they can still work very well. It can just be hard to tell who made them. I have one more question for you. Little nib–should I care? The function of the saw nib has been debated over and over, but Josh thinks it was purely decorative. No, it’s not an indicator of quality. All saw makers made some saws with nibs and some without. You’ll see a high end Disston 12 that has a nib, but their highest end D-8s don’t. It’s not indicative of quality or age. Disston was making saws with nibs up until the 1920s or so. It’s really a historical artifact. Henry Disston himself said it’s purely decorative. You’ll see some people say it’s for sighting down, or for cutting nails, or whatever. That just doesn’t make sense if you actually think about it. The only use I’ve ever seen for the nib–in practice–is to keep that little saw guard tied on to the plate, and honestly there’s a million other theories. I don’t care if the nib’s there or not. 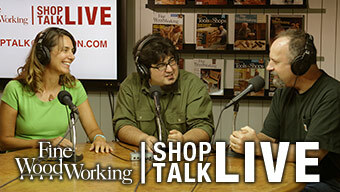 -Joshua Clark has been selling vintage hand tools and related items for over 10 years. 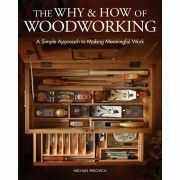 He specializes in woodworking tools especially vintage handsaws, backsaws, and molding planes, but tries to sell a little of everything. You can see his available tools at HyperKitten.com. Regarding the blade, you mentioned straightness, no kinks, few missing teeth... but what about the steel itself? Rust and pitting. What is acceptable? How can you tell if the steel is beyond redemption?